In response to “these unconventional and uncertain years,” veteran educator Rodger W. Bybee has written a book that’s as thought-provoking as it is constructive. Now more than ever, he writes, America needs reminders of both the themes that made it great in the first place and STEM’s contributions to its citizens.” Science educators must address STEM issues at local, national, and global levels. And teachers should help students tackle today’s problems with new approaches to STEM learning that complement traditional single-discipline programs. 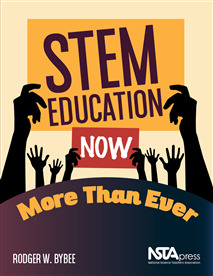 STEM Education Now More Than Ever addresses these themes through four wide-ranging sections. Parts of the book are what you might expect from a longtime thought leader in science education. In light of the 2016 election and recent assaults on science’s validity, Bybee strongly asserts the need for a new case for STEM education. Other parts may not seem typical for a book on STEM. He writes about the Enlightenment, the U.S. Constitution, democracy, and citizenship as reminders of the effects of STEM disciplines on America’s foundational ideas and values. In the end, Bybee ties it all together with positive, practical recommendations. A major one involves newer, faster ways to help teachers develop STEM units that address contemporary challenges in their classes. Another involves the importance of strong leadership from teachers and the STEM education community—leadership Bybee believes we need now more than ever.